Like many children growing up in the 1970s, Malcolm Collum, a ’95 graduate of Buffalo State’s art conservation program, eagerly awaited reruns of the original Star Trek TV series, the cult classic that ran from 1966 to 1969 and introduced multiple generations to the adventures of Captain Kirk (William Shatner) and Mr. Spock (Leonard Nimoy) and their crew aboard the USS Enterprise. What 48-year-old Collum didn’t know as a child was that one day he would have the opportunity to oversee conservation of the iconic starship that captured so many imaginations. 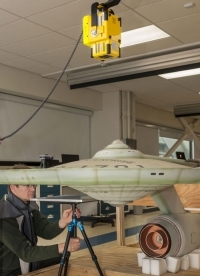 In his job as chief conservator and Engen Chair of Conservation for the Smithsonian’s National Air and Space Museum, Collum has been charged with bringing the 11-foot USS Enterprise studio model, which Paramount Studios gave to the museum in 1974, back to its former glory. “I know I’ve been handed a huge responsibility,” said Collum, who has worked at the museum since 2008. 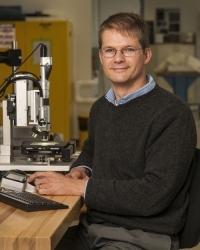 Previously, he served as senior conservator at the Henry Ford Museum. For the past 15 years, the starship has been on a centerpiece display in the museum’s gift shop, protected in a glass case. Now the museum is preparing for the Boeing “Milestones of Flight” exhibit that will open in 2016. And it’s fitting that the starship, one of several iconic artifacts included in the exhibition, will be given new life during the 50th anniversary of the original Star Trek series. First, the starship needs conservation treatment. 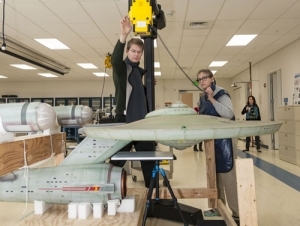 The Enterprise is now in a Smithsonian lab where Collum, in concert with curator Margaret Weitekamp, is embarking on a year-long project, which began with an assessment of its condition. He even borrowed an x-ray machine from the National Zoo to see inside. On the exterior, he has found definite evidence of the starship model’s age. The model also suffered damage from a move and a restoration in the early 1990s. Collum recently hired another Buffalo State Art Conservation graduate, Ariel O’Connor, ’09, to assist with the Enterprise project, along with other projects in the museum, and he plans to bring in an outside paint analysis specialist to help identify the model’s paint history, types, and sequences. He noted that the art conservation program prepared him well for the monumental task ahead. Learn more about the Enterprise project at trekcore.com.